Description: This "mini-set" is a great accessory set for the #915 Play Family Farm, or just by itself. This five piece set includes a tractor, cart, farmer, dog, and a rooster. The tractor used in this set is the same size and shape as the tractor used in the #915 Farm, except the tractor used in this set is green. FPT464 - Green tractor with 2 large Yellow back wheels. Has a litho on the engine that has a black background, 3 dots (red, yellow, and blue), and 2 red lines above the dots. Front 2 wheels held on via GREEN plastic rivets and the wheels are NOT marked. FPT480 - Yellow cart with Green plastic axles, wheels NOT marked. AOPP - Tall blue farmer with a yellow cowboy hat and a yellow triangle scarf. HWPP - Regular base Lucky dog wearing a red collar with lines on the outside of the collar. WF - Red chicken (rooster) with "Made in Hong Kong" written around the hole on his base. APPP - The farmer has also been seen with an orange triangle scarf oppose to yellow. FPT463 - Green tractor with 2 large Yellow back wheels. Has a litho on the engine that has a black background, 3 dots (red, yellow, and blue), and 2 red lines above the dots. Front 2 wheels held on via GREEN plastic rivets and the wheels are marked "FISHER-PRICE TOYS". FPT22010 - Green tractor with 2 large Green back wheels. Has a litho on the engine that has a black background, 3 dots (red, yellow, and blue), and 2 red lines above the dots. Front 2 wheels held on via GREEN plastic rivets and the wheels are NOT marked. FPT476 - Yellow tractor with 2 large Green back wheels. Has a litho on the engine (Litho Style B) that has a black background, 3 dots (red, yellow, and blue), and 2 red lines above the dots. Front 2 wheels held on via YELLOW plastic rivets and the wheels are NOT marked. FPT479 - Yellow cart with Green plastic axles, wheels marked "Fisher-Price Toys". This set was also sold in #633 Mini-Playset Assortment. This set was sold in a 9-1/8" long, 6-3/8" high, 3-13/16" deep display box. 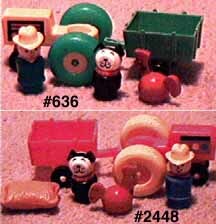 This set was replaced in 1985 with #2448 Farm Fun, which uses all of the pieces used in this set, except the #2448 also includes a plastic simulated burlap feed bag.